Start by laying two pieces of curb chain side by side. Tie on 4 feet of embroidery floss into a double knot to the end of the left chain, leaving at least a foot of extra slack. Thread the floss through the top of the first link of the right chain. Thread the floss under the first link on the left side and through the top of the 2nd link on the right side. 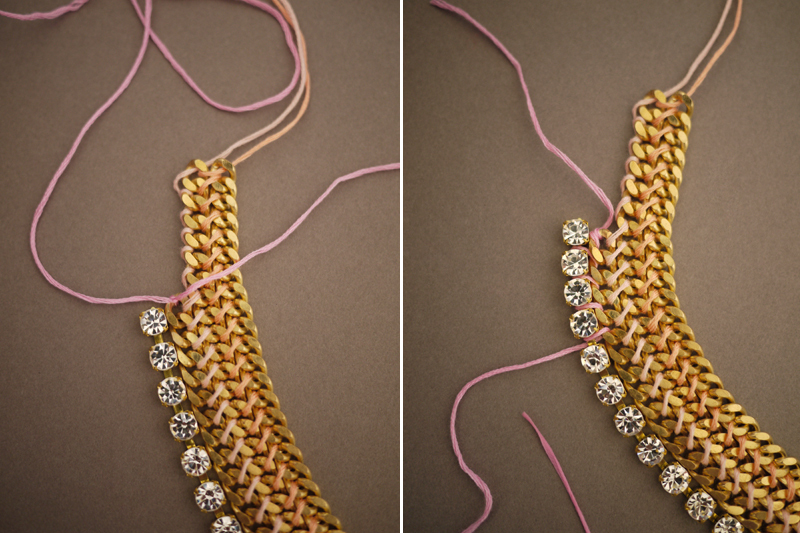 Continue this weaving pattern. 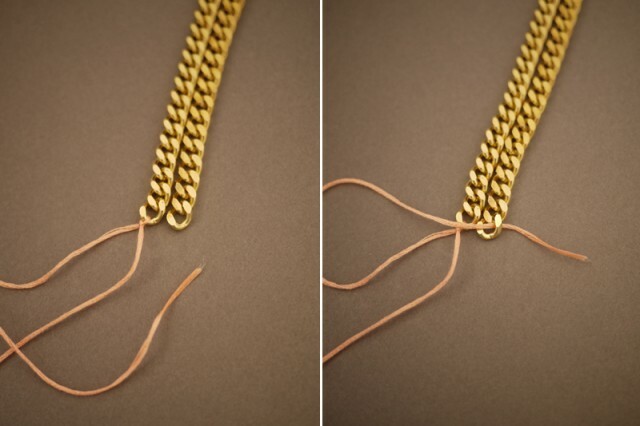 I find it easy to hold the chains up together while threading the floss back and forth. Tie a knot at the end. Alight a third piece of chain against the 2 woven chains. I chose to add a smaller piece here. 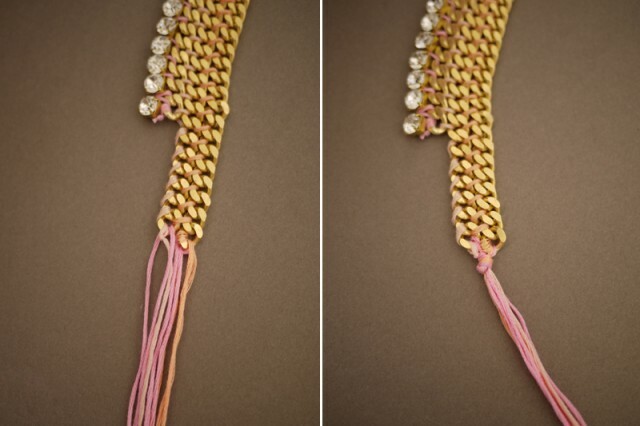 Using a different color flow, weave the floss around the first few links – again leaving about a foot of extra slack. 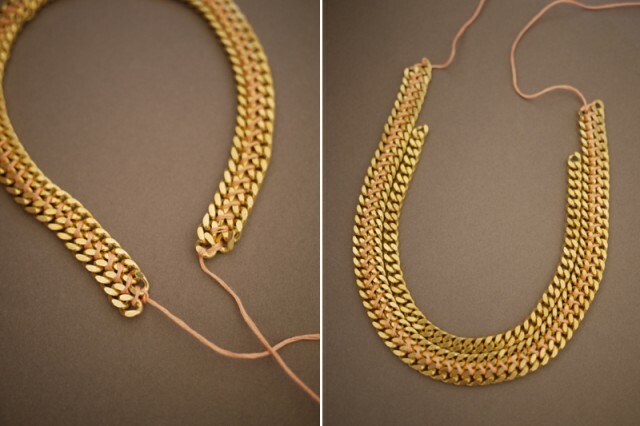 Weave the chain into the necklace using the same technique. 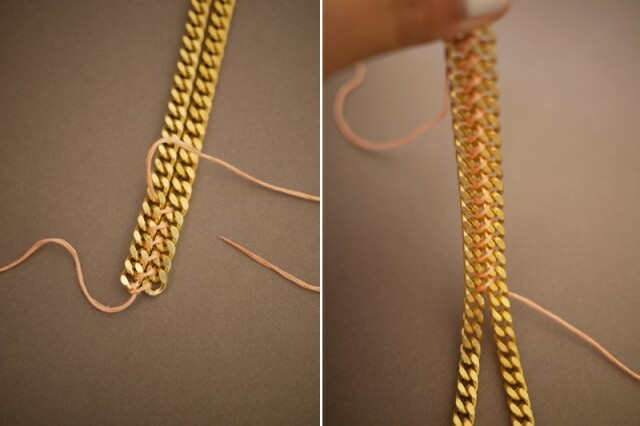 Continue weaving and tie a knot at the end. 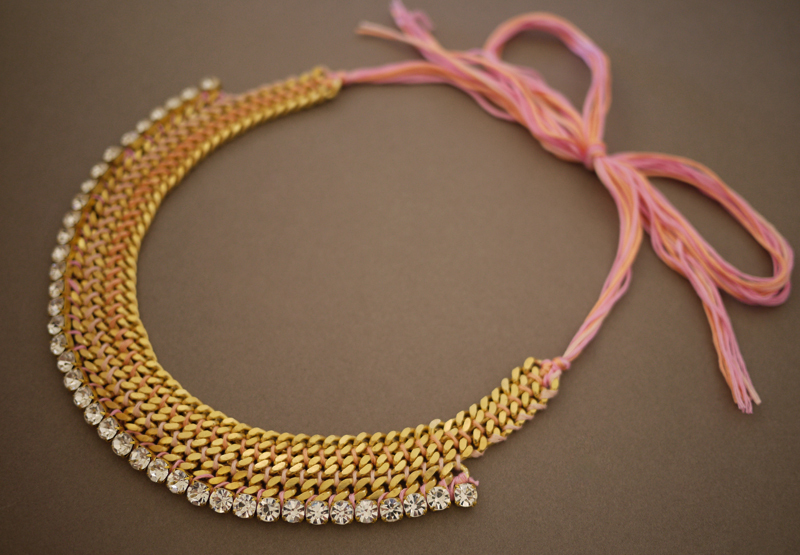 Now align the rhinestone chain along the necklace. 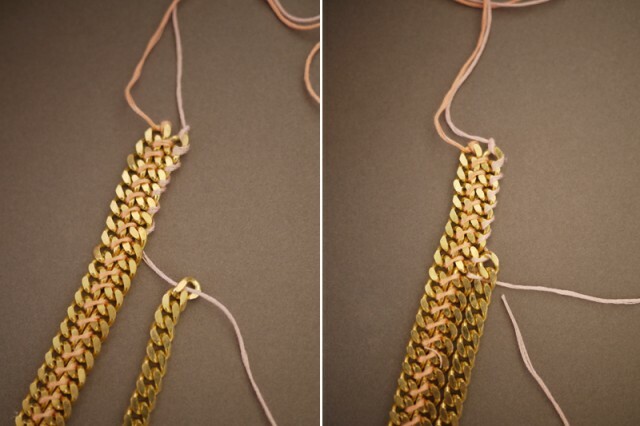 Tie a knot onto the chain. Start wrapping the rhinestones onto the chain but going under the first joint of the rhinestone chain and over the top of the first curb chain link. 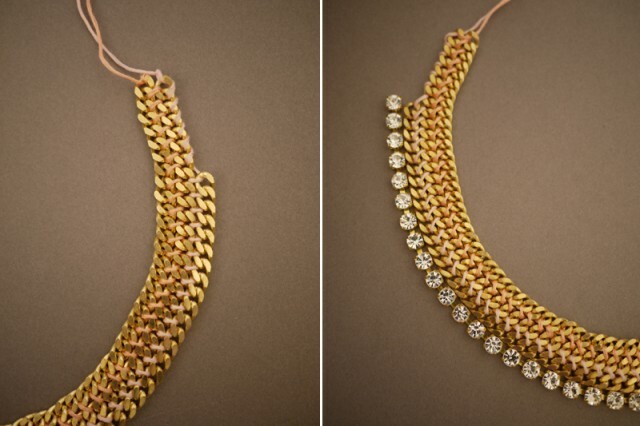 Keep the necklace curved while attaching the rhinestone chain. 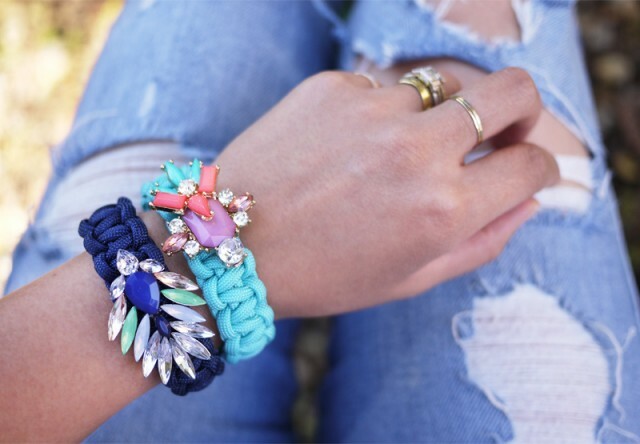 This will prevent the necklace from buckling. 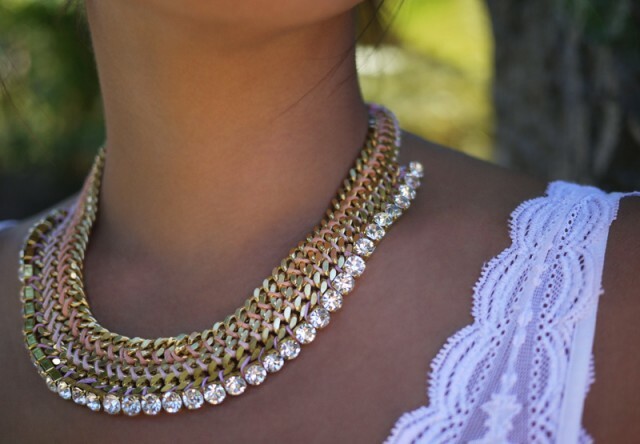 Depending on the size of the rhinestone chain compared to the chain, a few links may have to be skipped in order to maintain the shape of the necklace. Tie a knot at the end. 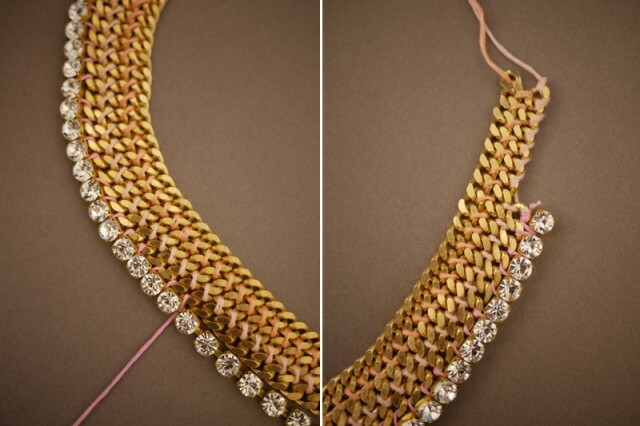 Cut several 2 feet strands of floss and thread them through the ends of the necklace. 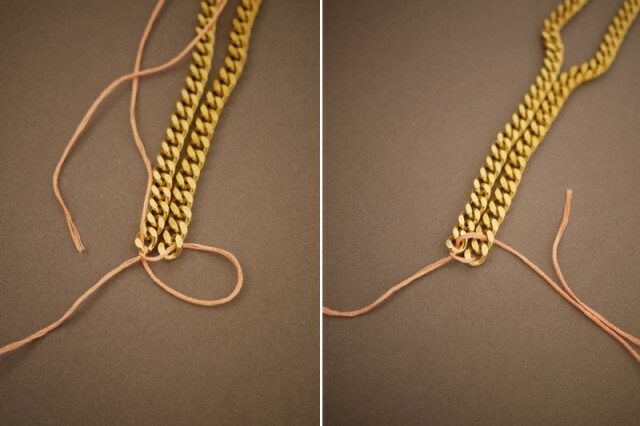 Tie a single knot. Repeat on the other side. Your necklace is now adjustable and finished!! Be sure to check out how Grace made a bolder version, using thick and coloful yarn, right this way!